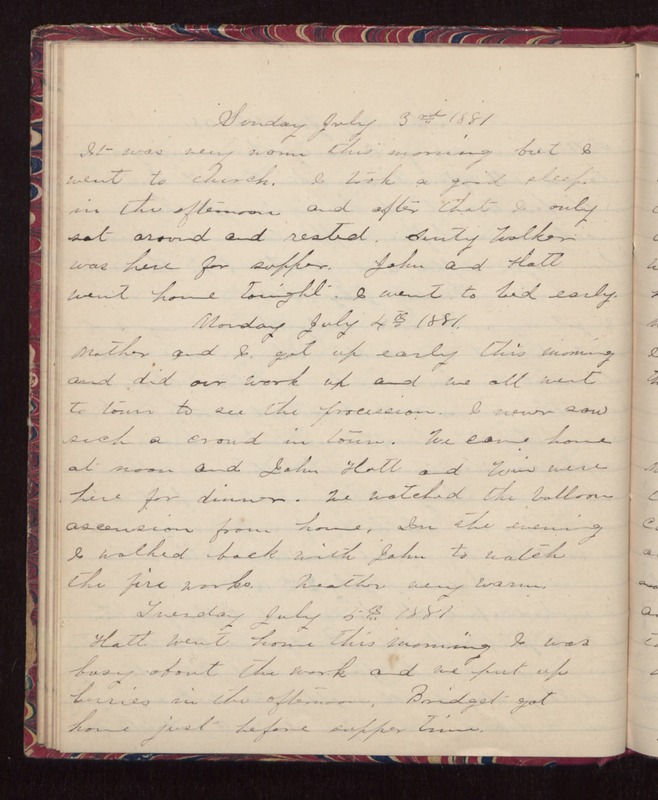 Sunday July 3rd 1881 It was very warm this morning but I went to church. I took a good sleep in the afternoon and after that I only sat around and rested. Aunty Walker was here for supper. John and Hatt went home tonight. I went to bed early. Monday July 4th 1881. Mother and I got up early this morning and did our work up and we all went to town to see the procession. I never saw such a crowd in town. We came home at noon and John, Hatt and Win were here for dinner. We watched the balloon ascension from home. In the evening I walked back with John to watch the fire works. Weather very warm. Tuesday July 5th 1881 Hatt went home this morning. I was busy about the work and we put up berries in the afternoon. Bridget got home just before supper time.